Regarding contact sports, there is a greater likelihood that a head injury is likely to occur. You see it all too often in the NFL on Sundays. A player has a suspected head injury/concussion, and they go into an NFL blue tent to be evaluated by an independent neurological consultant. Within a few minutes, these guys come out of the tent and even play a few plays, if not sometimes, finish the rest of the game before they truly go into concussion protocol. Of course the NFL states that they followed protocol (and is a huge multi-billion dollar business), but no matter the level, concussions are not treated and/or evaluated properly because of the pressures from family, coaching staff, and/or ownership/management surrounding the player who is injured. It is important to note that the current protocol on head injuries is that if a head injury is suspected, the player is not to be returned to competition for the remainder of the game. PERIOD. Most concussions, or mild traumatic brain injuries (MTBI) are mild in their symptom presentation, including “head fog”, temporary memory recall issues, coordination, headaches, nausea, sensitivity to light, sounds, or smells, just to name a few. Concussions need to be evaluated by sports certified chiropractors or any health care professional with experience in evaluating concussions/MTBI’s. Often, health care professionals who treat sports injuries, but are not certified in evaluating/managing head injuries, have no protocols in place if this scenario occurs. It is both dangerous to the athlete and the individuals involved in making health decisions for the athlete if not properly evaluated and examined as soon as possible by an expert. Sports certified chiropractors have mandatory training in head injuries as well as continuing education that is recommended to keep up with current concussion trends on how to evaluate and manage . It is critical that when a concussion/MTBI is suspected, evaluation is done right away, at 24 hours later (if possible), followed by another evaluation 1 day later. Restrictions are given to the athlete, parents, coaching staff, and teachers to ensure proper recovery following the initial examination and evaluation. Most symptoms of an MTBI with a mild nature presentation resolve within 7-10 days. Specific return to play (RTP) guidelines are issued by the sports certified chiropractor/expert and should be followed to ensure a proper recovery. 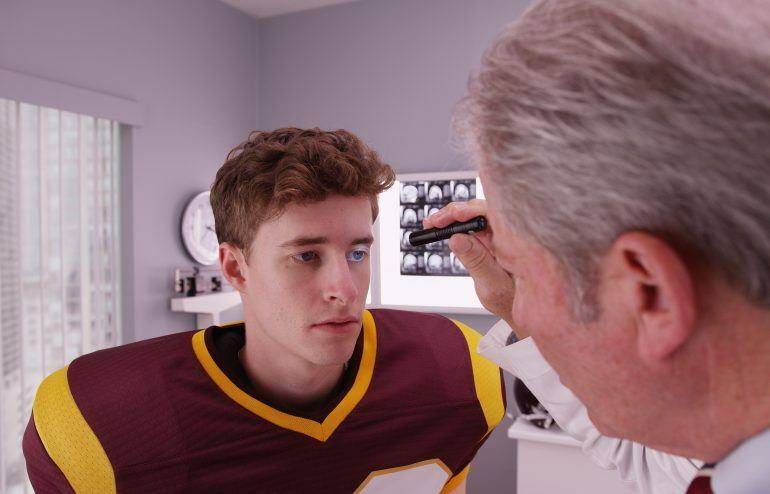 Sports certified chiropractors are not only qualified to evaluate and manage concussion symptoms, but they know how to act quickly and utilize the proper testing to ensure the safety of the athlete. Putting the athlete first in their recovery and not succumbing to the pressures of others guarantees proper recovery, and helps the athlete return to play faster without the residual effects of his initial injury. It’s YOUR Health, so make the right call.